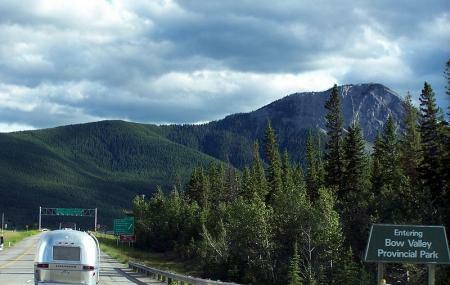 Find hotel near Bow Valley Provincial Par .. Bow Valley Provincial Park is a popular provincial park located in Alberta, just outside the town of Canmore. Featuring a spectacular mountain scenery, this park is quite popular for trout fishing in the Bow River. Other activities at the park include bird watching, camping, canoeing, kayaking, rafting, backcountry and front country hiking, horseback riding, wildlife viewing, windsurfing, and more. How popular is Bow Valley Provincial Park? People normally club together Stewart Creek Golf & Country Club and Bow Valley Provincial Park - Kananaskis Country while planning their visit to Bow Valley Provincial Park. Super dog friendly hike which is quite easy for beginners. The farther you make it the tougher it gets. We had notice that people were rock climbing with what looked to be a guide. All in all a great day hike close to the city. One of the most beautiful places in Canada. The mountains and the hiking is exquisite. Can't miss if in Alberta. The views and the trails are absolutely unparalleled by anywhere else in the world. There is so much to do that you could take a trip here for weeks or even months. I would absolutely recommend a trip here to anyone interested in being out in nature. This park has multiple campgrounds. We stayed at Lac Des Arcs campground. It is located very close to Hwy 1 near Canmore, Alberta Canada. This campground is located in grass land with a few trees. The campsites are basically mowed circles in the grass with bumpy dirt tracks. The campground road is grass and sand and generally poorly maintained. The sani-sump is located in the main park entrance a short drive from this campground. The water pump in the campground has untreated water not suitable for drinking or cooking. Beach area is muddy and looks polluted with brown foam and scum on the water. There is a nice playground and a small boat launch. This park is too close to the Hwy allowing for road noise in the campsites. Other campgrounds in this park may be better. Great place near Banff without tourists! There you can meet locals for sure. Nice views and place next to river where you can lay down on the beach in the sunny weather and chill out ! Love that place ! Awesome scenery. Note to anglers: be sure to check your location and fishing license. There are Provincial and Park licenses and those are different!! Thankfully the Ranger issued a ticket that would go into a effect if a current license wasn't presented. A quick trip to the park office and the proper license was purchased.